Benchmark your Leaf before buying! All cars drop in value as they get older, become worn, and have travelled further. 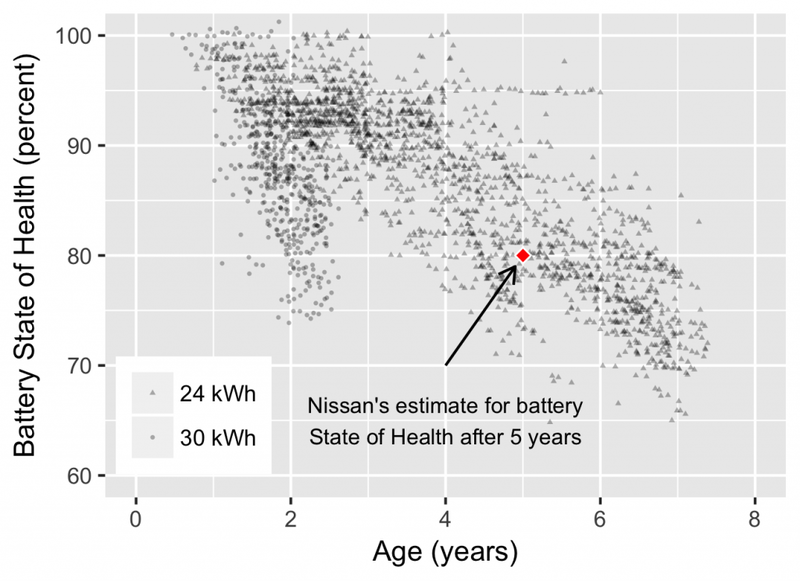 Electric vehicles have the added consideration of declining battery ‘State of Health’ (SoH). This is an estimation of how much charge the battery can hold compared to when it was first manufactured, so a brand new car will have 100% SoH. SoH is related to how far the car can go between charges, and time before you’ll have to do a battery make-over, and it is likely to affect the resale value of your car – so it’s best you check it out before buying. We recommend that you get a copy of a recent scan of the battery before purchasing or settling the price. Most dealers will scan the batteries and show the results if you ask, but otherwise get someone from your local EV Owners group to assist, or you can do it yourself by following the instructions at http://flipthefleet.org/resources/nissan-owners-how-to-scan-your-battery/. You can then compare your prospective purchase against the tables and graphs below that show the latest statistics from the Flip the Fleet database. Nissan Leaf SoH is measured by LeafSpy (upper) and dashboard ‘bars’ (lower) for cars. 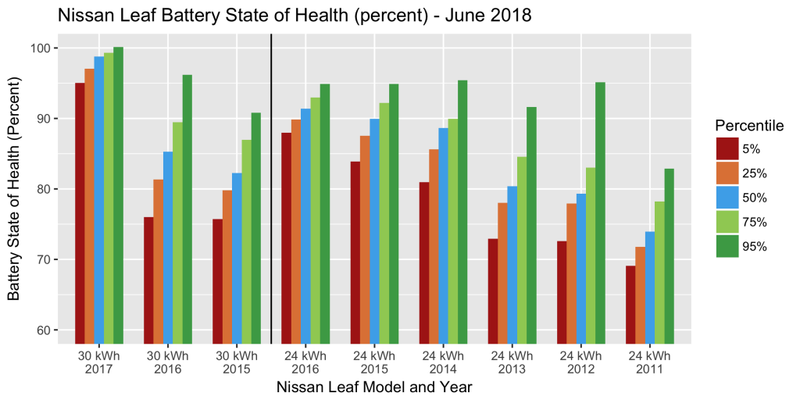 The graphs show the percentiles: 50% is the middle of the pack (half have a higher SoH and half lower); 5% of the EVs have a SoH less than the 5th percentile, and 95% above it. Please note that there is uncertainty in these values, especially in estimating the 5% and 95% percentiles, so caution is required when comparing a car to this data. Be aware that the top (twelfth) bar on the Leaf’s battery health display (extreme right of the dashboard) is worth more than the bars below it i.e. 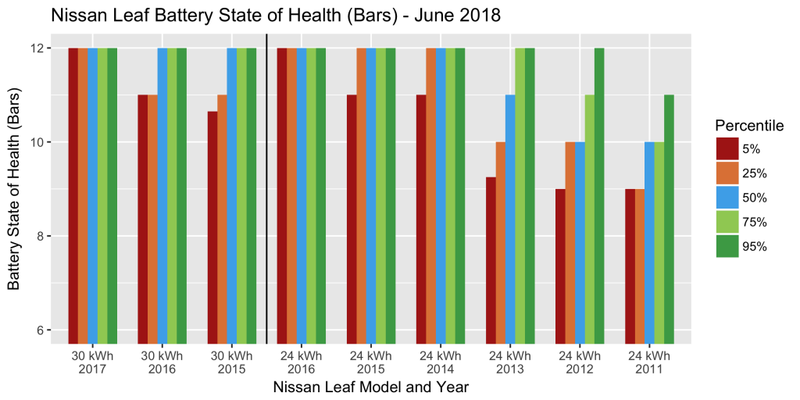 the 12th bar drops off when the SoH drops to around 85% (80% for the 30kWh variant of the Leaf). Thereafter each remaining bar drops off about equally, and each is worth about 6.25% of charge holding capacity. Therefore a 10-bar Leaf is likely to have a SoH somewhere between 72.5 and 78.75% SoH. The data presented in this post were for the May 2018 data upload cycle i.e. as reported in the first few days of June 2018. If you buy an EV, please sign up at www.flipthefleet.org and contribute your data for the people following you: this is a “By EV owners, for future EV owners” approach. Most commentators advise that the age of the car (year of manufacture) has a much stronger effect on SoH than distance travelled. The plot below shows how SoH relates to age, and indeed there is a strong relationship with age and SoH. However, there is a lot of variation: as an example, at 4 years of age, some cars are at 80% SoH while others are still close to 100% SoH.